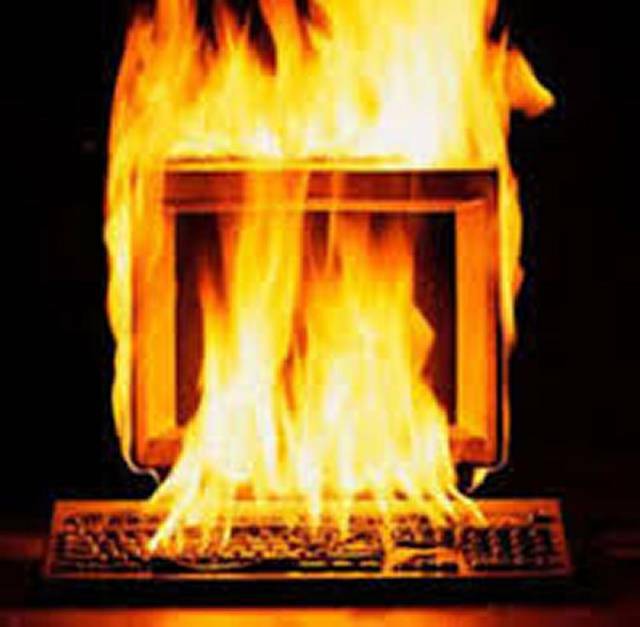 This computer is toast. Literally. Backups are easy to set and forget these days. 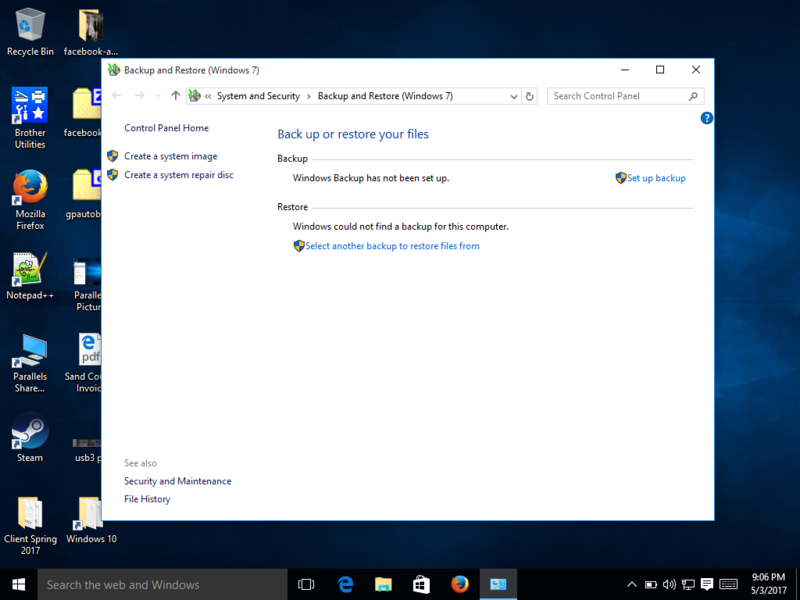 Windows has a built-in Backup and Restore utility in the Control Panel. Most external hard drives sold in stores come with their own backup software. Online cloud backup services such as BackBlaze or Carbonite run in the background and automatically upload your files to the cloud. So why do people not practice good backup hygiene? It’s hard to say for certain but not knowing how to setup a backup is probably one of them. Setting up both a local backup and a cloud backup is fairly painless and gives you peace of mind should anything happen to your computer or its files. To ensure that you are completely covered, you need both an external hard drive that is larger than the computer being backed up and a cloud service that stores your files offsite. The external hard drive is the first step to a good backup plan. 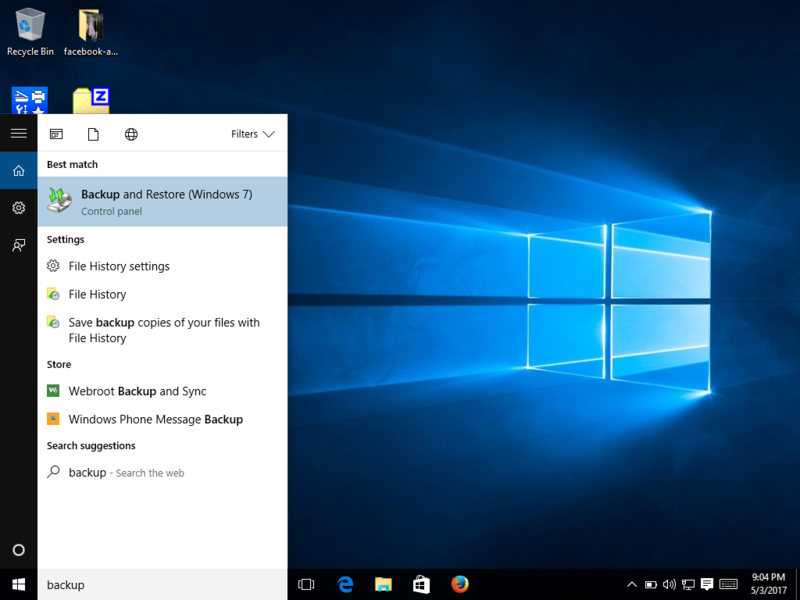 By having a three or four terabyte backup disk connected to your computer you can easily set Windows and OS X to backup to it automatically. This is called a local backup since the disk and computer are in close proximity to one another. A cloud backup service such as BackBlaze will allow you to backup your files offsite so if your home is hit by a disaster your files are still available. It’s typically slower to upload and download files over the Internet (hence the need for a local backup) but it is safer and more secure than a local backup typically is since presumably someone could walk off with your external hard drive or the external hard drive could be corrupted or fail. These instructions use Windows 10 for the description and screenshots but the setup process is the same for Windows 7, Vista, and 8. Plug your external hard drive into a USB port on the back of your computer. You should look for a port that is labeled SS and is blue in color. This is a USB 3 port, which can transfer data at much faster speeds than a standard USB 2 port can. If you do not have any USB 3 ports you can use a USB 2 port but your backups will take longer to complete, especially the first time. 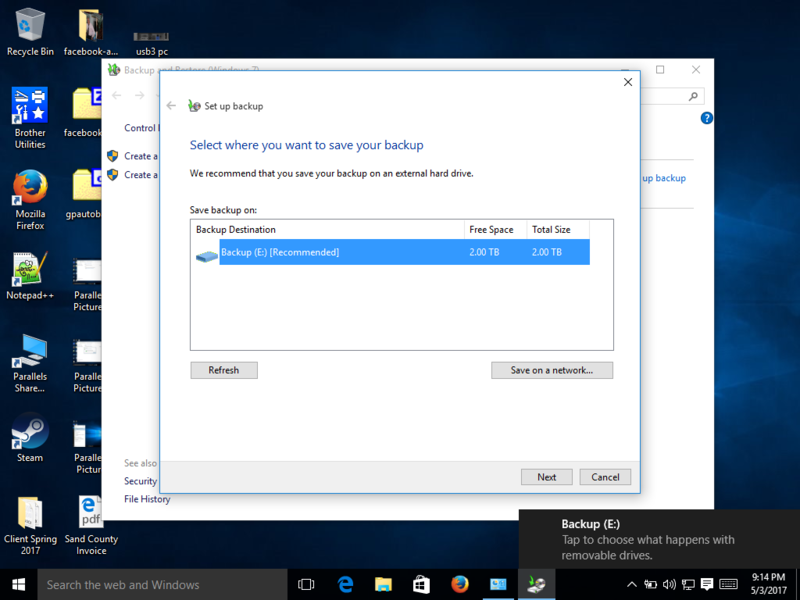 After you’ve plugged in your external drive, type the word backup into the search bar and open the item that says Backup and Restore (Windows 7). It says Windows 7 because the Backup and Restore utility has not changed since Windows 7. It will still work just fine on Windows 10. Click on the Set up backup link on the right side of the screen. After a few moments, your external hard drive will appear as a destination to use for backing up. Select that disk and click Next. 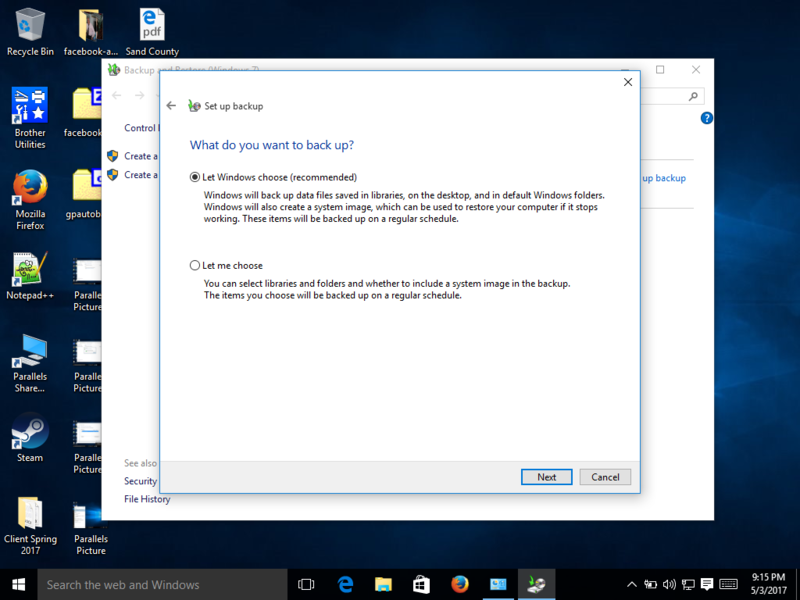 On the next screen you’ll be asked if you want Windows to choose what gets backed up or if you want to select individual drives, files, and folders to backup. 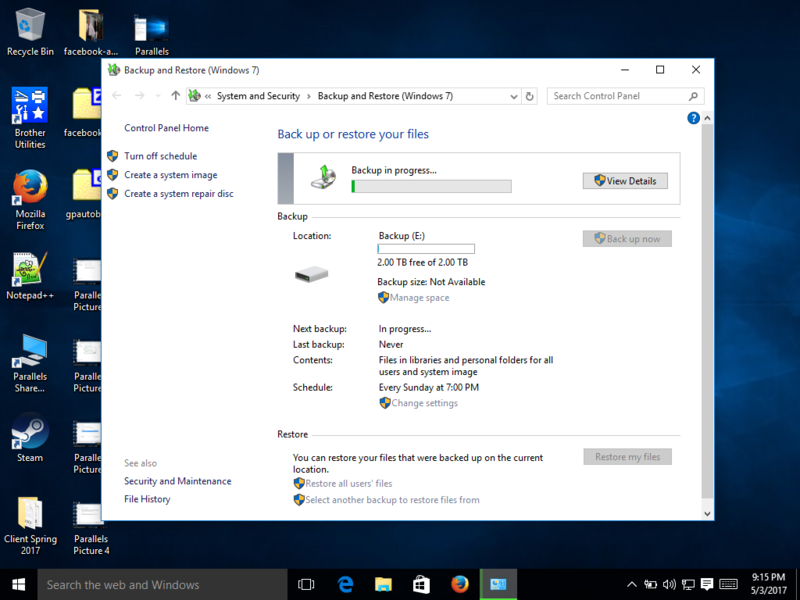 I recommend letting Windows back things up since it will grab everything on your drive and create a system image, which can be used to restore your computer if the hard drive fails. Click Next to continue. Your computer will then start backing up your computer to your external hard drive. The first backup will take some time, depending on how many files you have to backup. After the first backup is complete subsequent backups will take only a fraction of the time to complete since it only grabs files and folders that have changed since the last backup. You’ll also be able to change the schedule if you’d like to a day and time that works better for you. 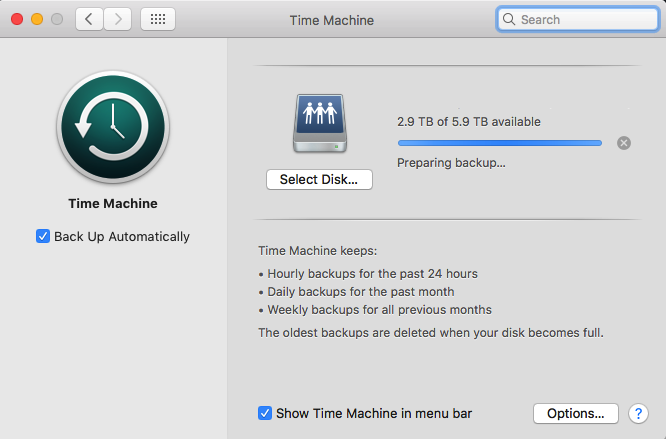 OS X/macOS have a built-in backup utility called Time Machine. When you first plug in your external drive you’ll be asked if you want to use it for a Time Machine backup. Allowing your Apple to use this device as a Time Machine backup disk will automatically configure and start the backup process for you – no intervention is required really. You can change your Time Machine preferences by going to the Apple menu, System Preferences, and clicking on Time Machine. A cloud backup service such as BackBlaze (of which Jay’s Computers and Repair is an affiliate) allows you to backup your files to the “cloud”, or someone else’s servers. Backups done in the cloud are typically encrypted so only you can access your files. The specific process to setup a cloud-based backup differs widely among cloud backup providers but typically involves installing a backup client that runs on your computer and silently backs up your files in the background. It really is a set-it-and-forget-it type of backup that will be very useful if your local disk and your computer fail due to a natural disaster, fire, or theft. Costs and storage space among cloud backup providers differs by company. Our preferred provider, BackBlaze, charges $5/month per computer for unlimited backup space. Jay’s Computers and Repair would be more than happy to get you or your business setup with a reasonable backup plan that will ensure a reliable, secure, and fast experience. Contact us today for your backup needs!